Home > International News > Deep Sea Mining: The Next Gold Rush? Deep Sea Mining: The Next Gold Rush? 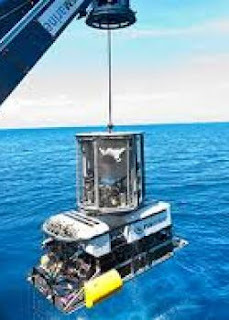 As determined stakeholders continue to innovate proposed 2019 expedition has its sights set on the coast of Papua New Guinea, where if all goes according to plan, three 200-tonne machines will troll the bottom of the Bismarck Sea for deposits of copper and gold, for Canadian mining company Nautilus Minerals. The remote-controlled robots will use enormous, spiked-covered bulk cutters to churn and grind the ocean floor, to reach as yet untouched reserves of deep-ocean minerals formed over millions of years. The expedition has already raised pressing ethical, economic and environmental questions, such as: Can the deep oceans be mined without creating the same degradation and risks as land-based mining? And is there enough incentive to do so? Nautilus CEO Michael Johnston has designed what he considers an expedition with a much-smaller environmental impact than a comparable one on land. Johnston’s Solwara-1 will be the first expedition to extract minerals from the deep sea. Deep-sea reserves of precious minerals build up on rocks and soft sediments. The deepest, 6,000 meters down, are called polymetallic nodules and form as debris from fossils and shark teeth collects in the sediment. These nodules - rich in nickel, copper, cobalt and lithium - can grow to the size of footballs. A second variety occurs as metals seep out of the water onto rocks, making a pavement-like surface called ferromanganese crusts, rich in cobalt and more rare elements such as tellurium, which is used to make solar cells. In a third type, minerals concentrate in seafloor massive sulfide deposits - rich in copper, gold, silver and zinc - that form around hydrothermal vents; superhot fluid spews upwards, depositing minerals into the surrounding water. While these reserves understandably represent an untapped gold mine, many experts fear this new manifest destiny: As Carol J. Clouse pointed out in her Guardian article, the ocean plays a critical role in the Earth’s biosphere – it regulates global temperatures, stores carbon and is home to a huge array of sea life. Scientists and environmental advocates fear that mining the deep ocean will not only kill any marine life that gets in the way, it could potentially devastate far wider areas by stirring up sediment and introducing chemical, noise and light pollution – and eventually affect us on land. "There are too many unknowns for this industry to go ahead," Natalie Lowrey of Australia-based Deep Sea Mining Campaign, said in a recent interview. "We've already desecrated a lot of our lands. We don't need to be doing that in the deep sea. There's a serious concern that the toxicity from disturbing the deep sea can move up the food chain to the local communities. If Nautilus goes ahead, it's going to open the gateway for this industry." Dr Cindy Lee Van Dover is director of the Duke University Marine Laboratory in North Carolina and a member of the Deep-Ocean Stewardship Initiative, an international group of scientists, lawyers and advocates that makes environmental recommendations to the International Seabed Authority (ISA). ISA regulates deep-sea mining in international waters and has so far granted 28 countries contracts to explore for minerals. The nascent industry will also be costly in financial as well as environmental currency: Nautilus has had setbacks in funding the roughly $480m project and still needs to raise $150-$250m to move forward. Whether with Nautilus or some other intrepid mining company, it’s only a matter of time (and money) until that gateway swings wide open – and as our territorial imperative takes a deep dive, we’ll soon discover all of the benefits, and costs, of plumbing the depths of our natural resources. Sheila Shayon, President of Third Eye Media, is a senior media executive with twenty five plus years in television and new media including expertise in programming, production, broadband, start-up models, creative and branding strategies, digital content and social networking.